Since I am a translator of Japanese and a fan of Jabba the Hutt, I found it very difficult to resist a product called a “Huttese Translator Ring” (although it’s more of a decoder ring than a “translator” ring.) I’m fascinated by writing systems in general, but I hadn’t given much thought to how Huttese was written down before. Here’s what I found after a little research. 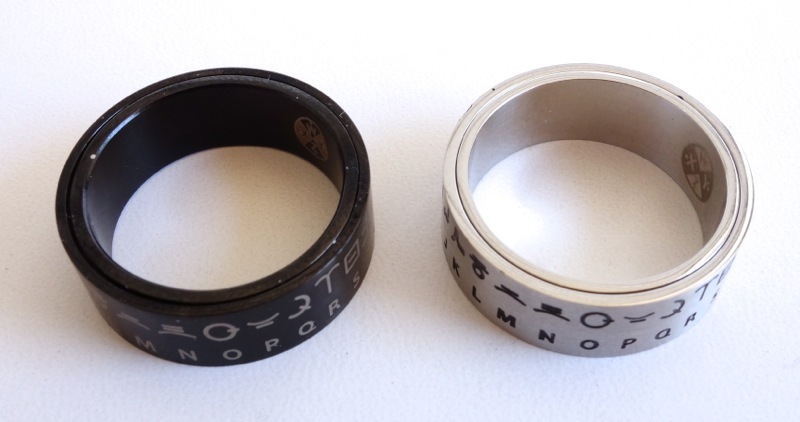 The alphabet used on these rings is called “Trade Huttese” and is supposedly a simplified version of the written language used when Hutts are dealing with outsiders. My feeling is that the pizza box version of the script was retconned into “Trade Huttese” after they created the version used in Episode One. 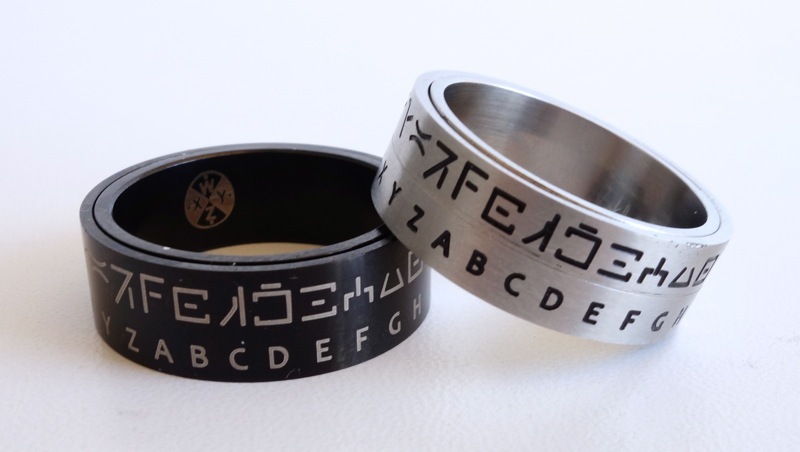 Why they chose to use this obscure version of the language for these rings rather than the one used in the movie is a bit of a mystery, but it may simply be due to the fact that a complete alphabet isn’t available in Nal-Huttese — at least not an official one. There are some Nal-Huttese fonts and character charts available on the net, but these all seem to be fan-made and are not necessarily canonical. At least the “Trade Huttese” alphabet appeared in an official product, albeit a pizza box. It’s a little too bad they couldn’t have used Nal-Huttese, since it looks cool while Trade Huttese looks very similar to Aurebesh (they also made a translator ring for that, by the way). Then again, Nal-Huttese would be very difficult to write and decipher, so if you wanted to actually use the ring to write some secret messages, Trade Huttese would be the better choice. The rings themselves are “spinner” rings, made from two concentric rings so that the outer ring can spin freely, allowing you to spin it around to see all sides of the ring easily. But even though I ordered the “Large” version, I found they were just slightly too small for me. I can get them on easily enough, but getting them off is another matter. The “spinner” feature makes things difficult since you can’t really twist the ring to get it off your finger. They’re both quite nice. A great idea. I use Trade Huttese all the time. Easier to write with and in my free time invented a cursive form of it.